The Internet might be virtual, but customers live in physical space and at least sometimes they need to visit companies in the real world. Given this fact of life, geography determines business success in a very simple way: Customers can either find your locations or they cannot. Websites play a major role in helping customers find their way to company locations, including branches, stores, offices, dealers, and other outlets such as ATMs, package-dropoff points, or facilities that accept returned goods for ecommerce sites. Whenever customers need to do business at a physical location, a company’s website should help them find the most convenient location that offers the services they need. To assess the usability of store finders and locators, we have conducted four rounds of usability studies, with a total of 46 users testing the location finders on 28 desktop websites and 28 mobile websites and apps. For each round of testing, we chose companies that represent a range of industries — from traditional retailers, financial institutions, and high-tech companies to restaurants and the US Post Office. Each website represented a number of locations, ranging from just a few (2–10) to thousands. In each round of testing, we asked users to find the company location closest to them (or closest to a specified address) and to get directions to that location. Sometimes, we also asked users to find a location that met certain special requirements, such as being open at a certain time or possessing a specified amenity or service such as a drive-through. Comparing the 4 rounds of testing allows us to assess long-term trends in locator usability. And wow, have there been changes. Most strikingly, users’ success rates in finding and using the locators increased from 63% in Study 1 to 96% in Study 2, which was conducted in 2008. Thankfully, user success rates have remained at this high rate now, at 97% in Study 4. Ninety-seven percent is an astoundingly high success rate. Of course, finding an appropriate location address is a simple task compared to using other website services. Consider, for example, the much higher complexity of tasks such as managing your investments, researching car purchases and financing, deciding which hydraulic excavator best suits your copper mine, or even buying a birthday present for your nephew. Still, it’s great to see locator usability increase this much. All is not perfect, however. Users accomplished only 57% of the locator tasks easily. Thus, even though users directly failed only 3% of the time, they encountered difficulty with the locators 40% of the time. Particularly for a simple feature like the locator, it must be not only possible to accomplish the task, but also easy and pleasant to do so. On this stricter usability requirement, locators still have a lot of room for improvement. All three of these steps must be easy. One of the biggest reasons for the dramatic increase in locator usability in Study 2 was that the first step is now fairly easy because — as recommended — most sites offer clearly labeled links to their locators. Made-up or fancy link names are almost a thing of the past. In Study 1, only 30% of sites included an obvious link to the locator, whereas 90% of the sites in Study 2 did so. This trend has persisted, and 91% of the sites in the most recent Study 4 included an obvious link to the locator. Step 3 is also easier now, as most sites use better mapping services than we saw originally. Step 2 is the main culprit in usability problems these days: The actual location finders are either too complex, or they are oversimplified, making it more difficult for users to find which locations meet their needs. Another big difference compared to our initial study is the strong increase in search dominance when looking for company locations. This is no surprise; we’ve found increasing search dominance in many other recent studies as well. In our recent research, 80% of users went directly to a search engine or dedicated mapping app (mainly Google Maps) when we asked them to find a nearby location for their personal bank, while the remaining 20% navigated directly to their bank’s website or app. As soon as users already on your site decide to do business with you, they should be able to easily access a location finder. Because they might make this decision on any page of your site, all pages should link to the locator. Even people who start out at a search engine will often prefer your site’s locator tool for specific details, such as what services or amenities are offered. To make this option possible, your site must have a locator. Further, you should maintain an up-to-date, accurate list of features available at each location, and make sure that this information is findable by those who search for it on the web. The availability of geolocation for both mobile and desktop computers has substantially improved the UX of store locators in the past decade. The ability to use their current location saves users the effort to type in the many situations when they are interested in stores close to them. This functionality is especially important to users on mobile devices, but is helpful on desktop as well. Many of the websites we tested in Studies 3 and 4 included the option to use current location to begin a search. The majority of study participants allowed access to their current location when the site requested it. Some desktop users did not notice the browser popup requesting their location because their attention was focused elsewhere on the page. Moreover, sometimes denying access to the current location prevented people from changing their mind later on in the session. Therefore, we recommend that you include an explicit Use Current Location element (either button, checkbox, or link) in the locator form in order to enable the use of current location. UPS (left) and Famous Footwear (right) both included options to conduct a location search using the device’s current location. Before smartphones became ubiquitous, people used to print directions to take with them on the road. This habit has died: everybody has now access to a smartphone map application at all times. While our initial guidelines related to ensuring usability of printed directions still hold true, they are no longer relevant to current designs. What is more important for locators today is streamlining the movement across multiple devices. Links to send a location to your phone from a desktop site or to share with a friend are relevant and helpful to users. 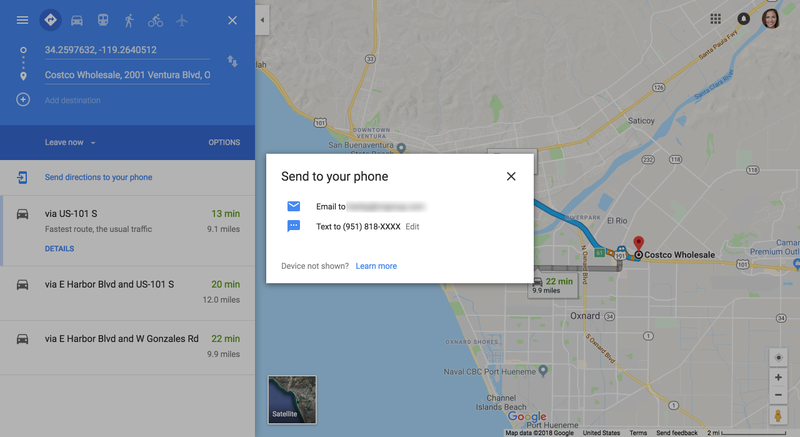 Google Maps included a link to Send directions to your phone above route information. Clicking the link opened a modal window to select whether to email or text the directions to the user’s device. The Share feature was available on the REI mobile app, making it easy to send the location to another person via email, SMS message, or social networks. Another noticeable change over our years of research is users’ increasing reliance on external mapping tools such as Google Maps, Apple Maps, or Waze to provide turn-by-turn directions. Companies have reacted to this new state of facts. In Study 4, only two of the 11 sites tested used an on-site map tool to provide directions. All others linked out to an external mapping tool. This movement to leveraging external mapping tools is actually welcome and leads to a better, more consistent user experience. People can rely on an interface that is familiar and trustworthy (that of their phone’s native map app on mobile or of Google Maps on desktop) instead of having to learn a new map interface for every website they visit. The new edition of our full 197-page report on Store Finders and Locators with 56 evidence-based UX design guidelines is now available. It is published as a volume within the new edition of the Ecommerce User Experience report series but can also be read as a stand-alone report. It does include design advice for non-ecommerce sites (e.g., retail chains, banks, and so on) as well as ecommerce.